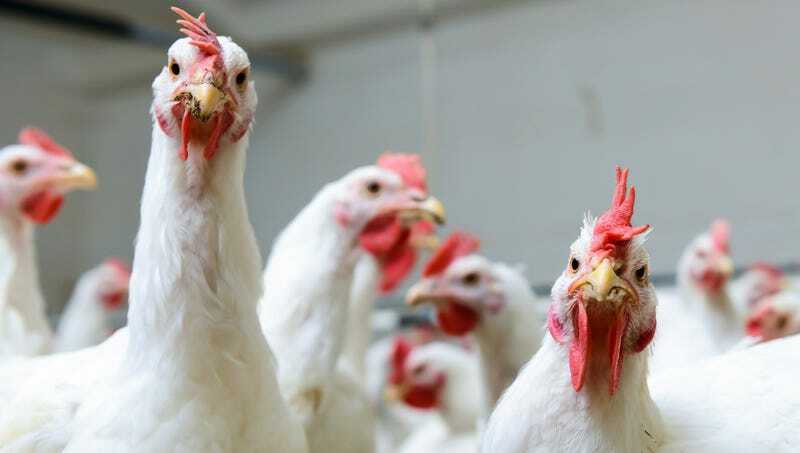 MADISON, WI—Saying the animals would not pause for a second if given the chance, a new study published by the University of Wisconsin on Tuesday found that chickens would have absolutely no qualms about caging and eating humans. “All the evidence clearly suggests that chickens would absolutely stuff human beings into poorly ventilated cages and then eat them without any hesitation whatsoever,” said lead author Aliyah Carter, adding that the domestic fowls would not waver at all if the opportunity arose to cram people into windowless, disease-ridden coops and overfeed them to the point that their legs literally could not support their bodies. “Chickens don’t appear to have even the slightest aversion to pumping humans full of antibiotics and aggressively breeding them until they literally die from exhaustion. Simply put, they would be more than happy to grind us up and form us into patties, and would begin doing so at a moment’s notice if they could.” Carter went on to say that the findings support similar studies surveying animals such as cows, pigs, and fish, with only horses indicating that it was sufficient if humans were merely enslaved.